Is it a challenge to clean your shower? Many home owners will throw up their hands in dismay after hours of trying to get the water and scale stains off their bathroom surfaces. They believe that there is no other solution other than to replace the entire shower unit. This is not so as Belinda found out after she met Cameron at the Wellington Home Show. The older shower in Belinda and Alan Clare’s Seatoun home was the perfect opportunity for Cameron. At least 10 years old with two walls of tile and grout, and two of glass it needed the full Canny Makeover treatment. Belinda reckons that even Cameron was little taken aback when he saw her disaster of a shower but he was always confident that he could return it to its original glory. Cameron restored Belinda’s shower to its formal glory. Firstly all the mould inhibited silicon was removed, followed by the water staining and lime scale. An electric polisher, non-scratch pads and professional water spot remover were used on the chrome and glass. 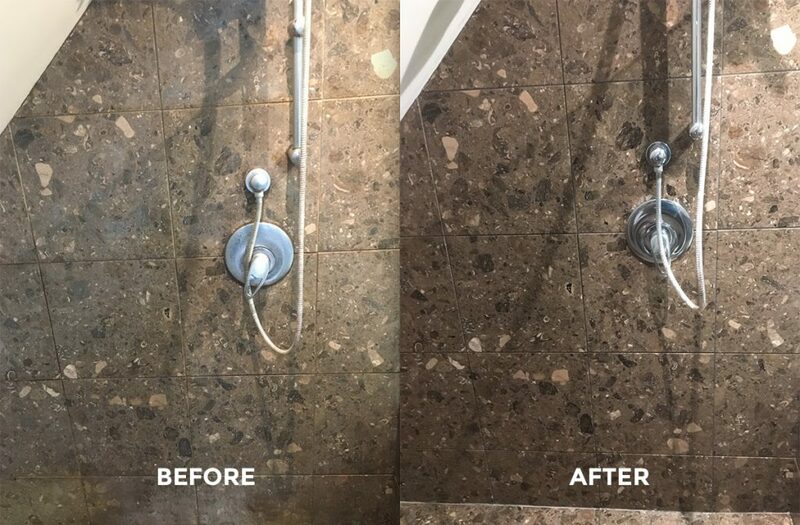 Aqua Mix and EffEx were used to give the natural stone and grout surfaces a deep clean, removing limescale, soap scum and mineral build up.Etching on the natural stone was removed using the Holer Diamond pads 3 STEP polishing process was used, restoring the original shine. Aqua Mix Enrich’N’Seal™ was applied to protect and highlight the character and beauty of the natural stone and grout. It seals and darkens the colour of grout joints and provides maximum stain protection. A Clearshield protective coating was then applied to all the glass surfaces to ensure maximum stain resistance and easier ongoing maintenance. 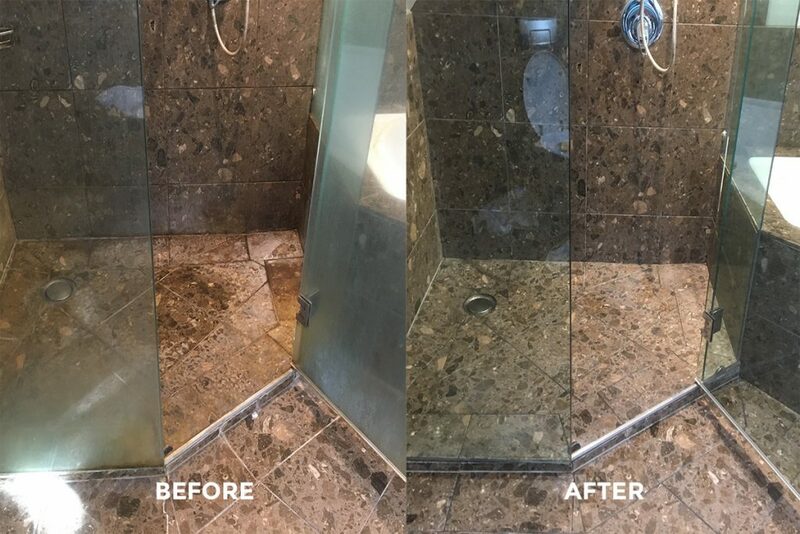 The whole shower was completed with a new silicone coating applied to finish the job and give Belinda that new bathroom look without the cost and hassle of installing a new bathroom.